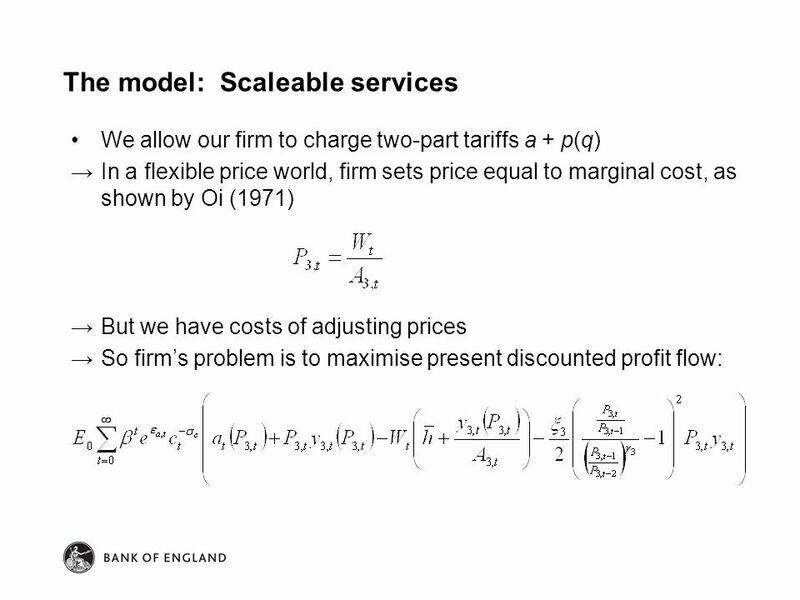 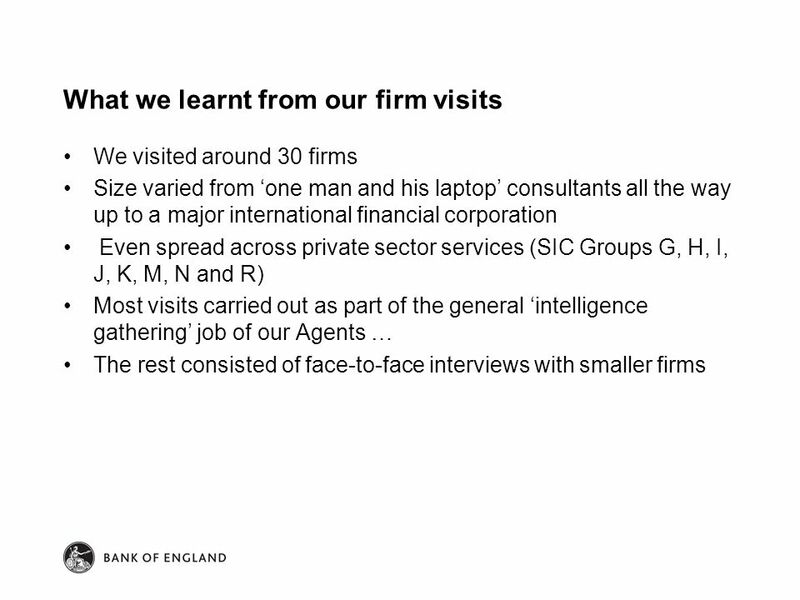 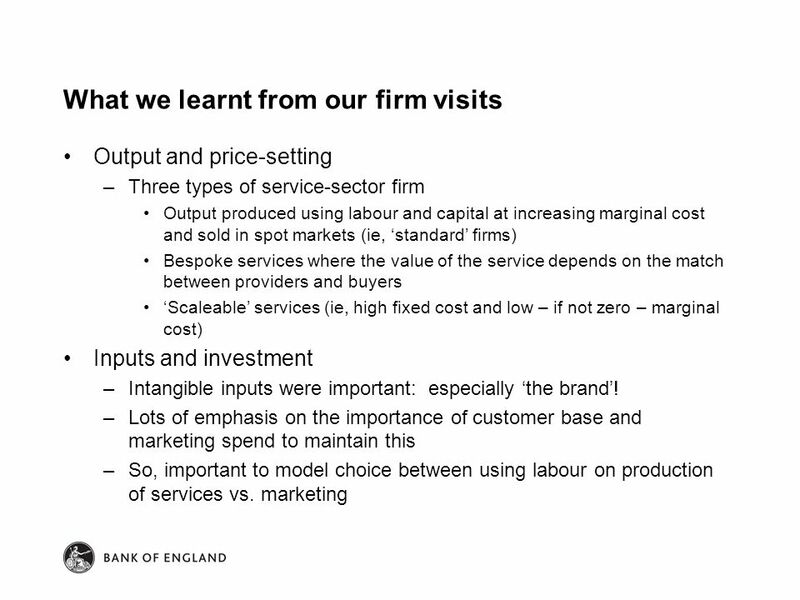 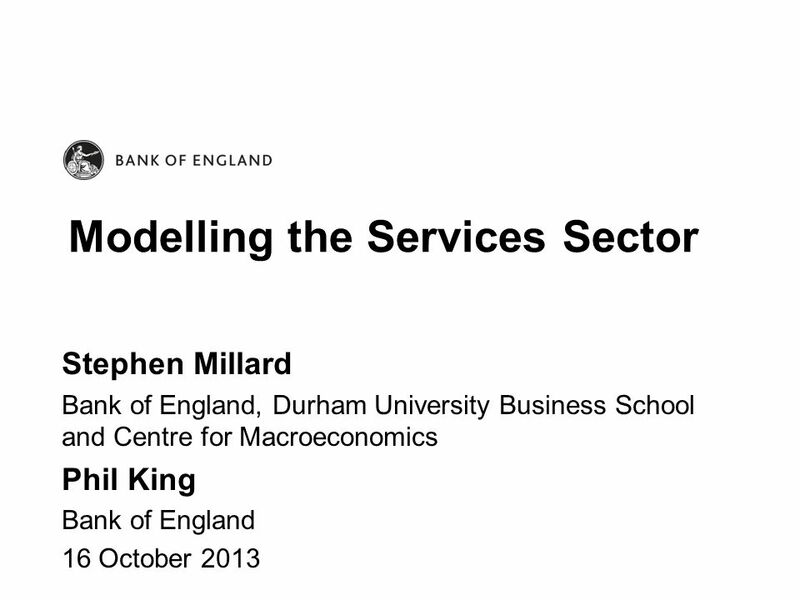 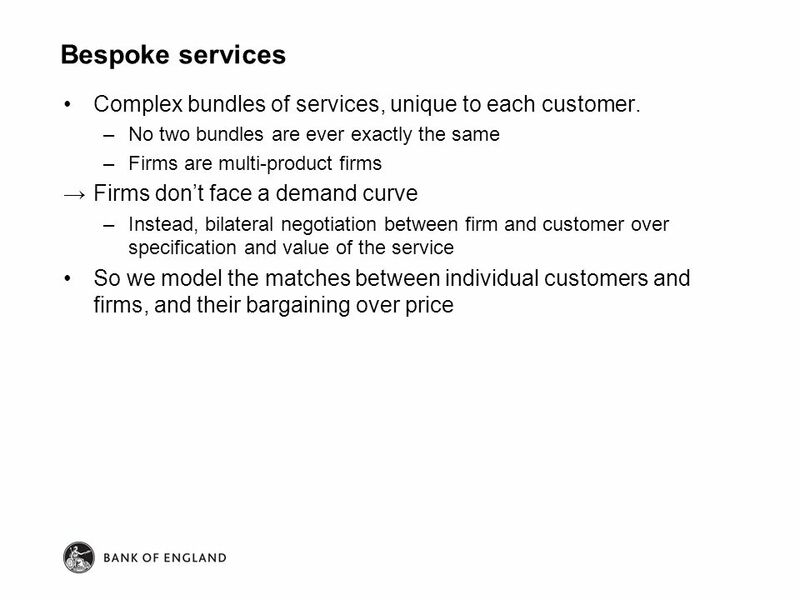 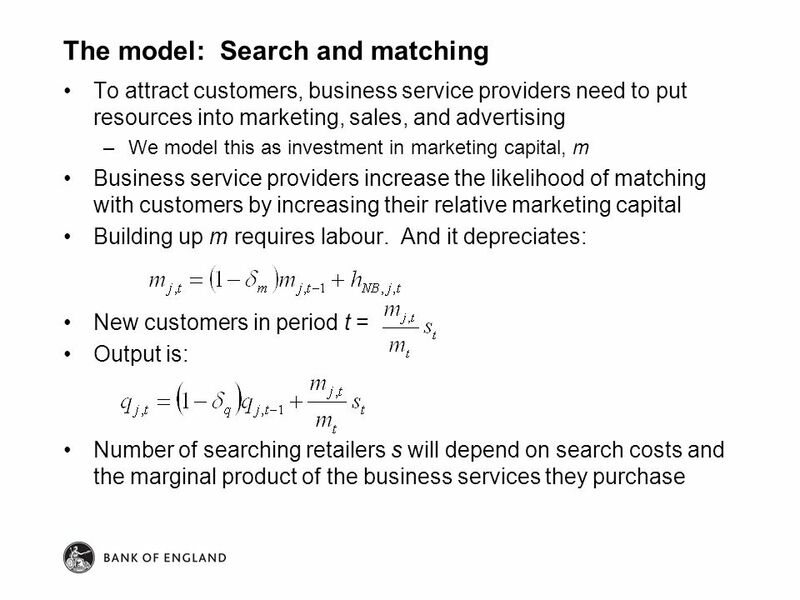 Modelling the Services Sector Stephen Millard Bank of England, Durham University Business School and Centre for Macroeconomics Phil King Bank of England. 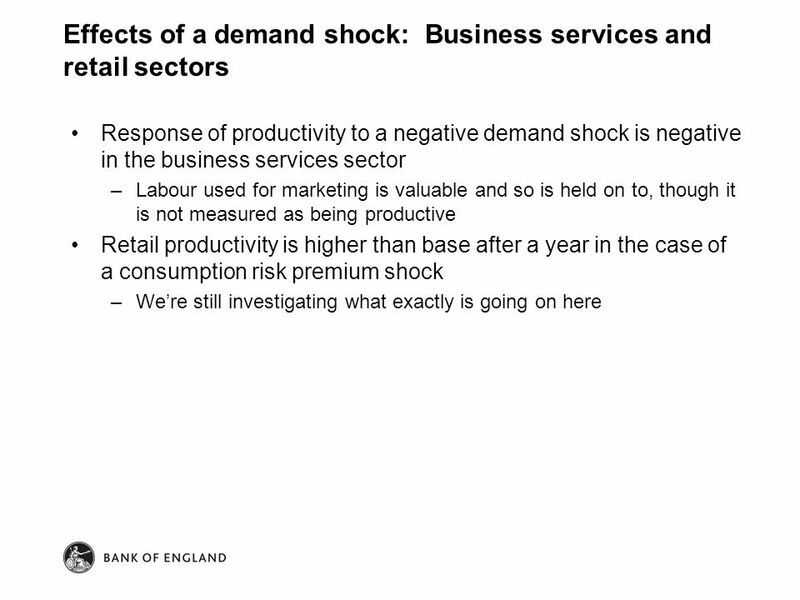 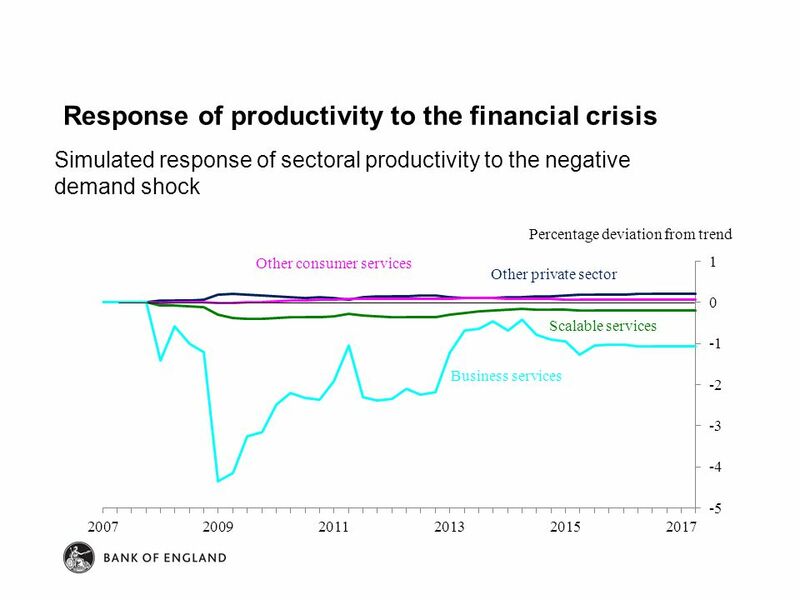 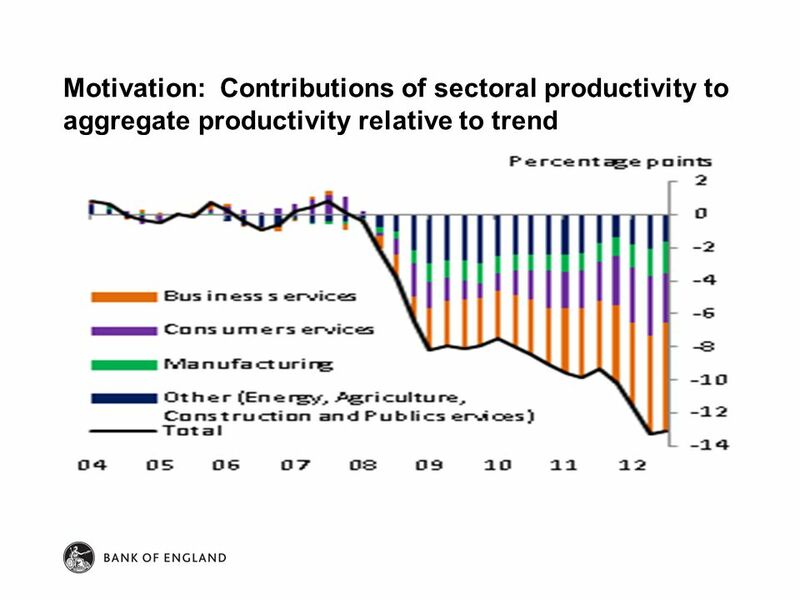 2 Motivation 1.Recent poor UK productivity performance most obvious in service sector. 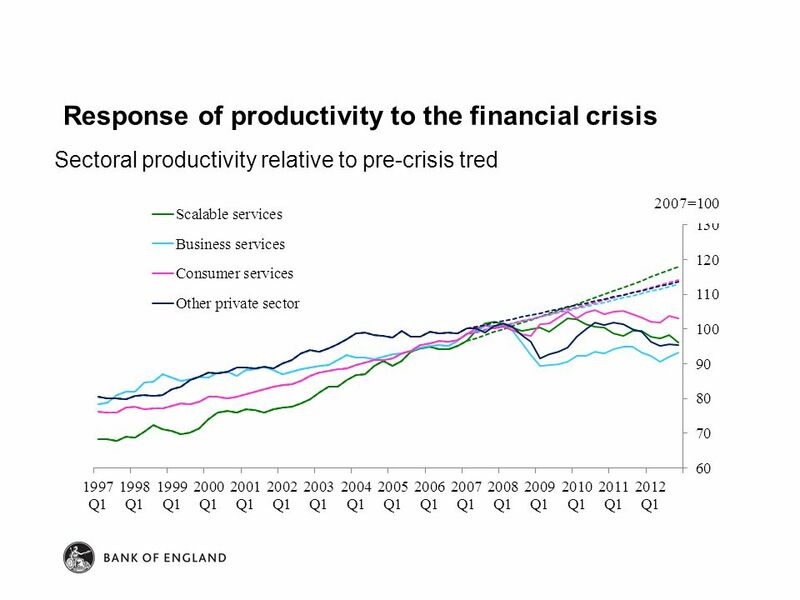 Is this a permanent feature or will service-sector productivity recover as demand picks up? 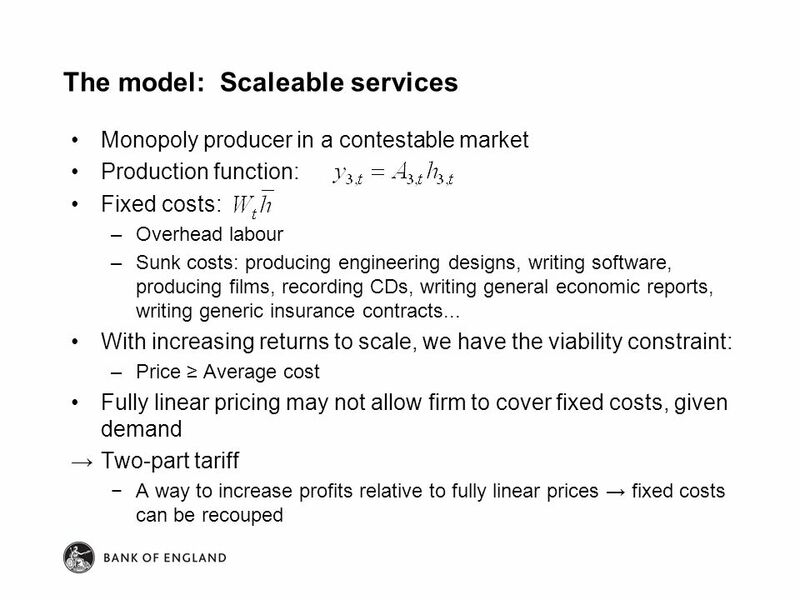 2.Firms in standard macroeconomic models look like manufacturers. 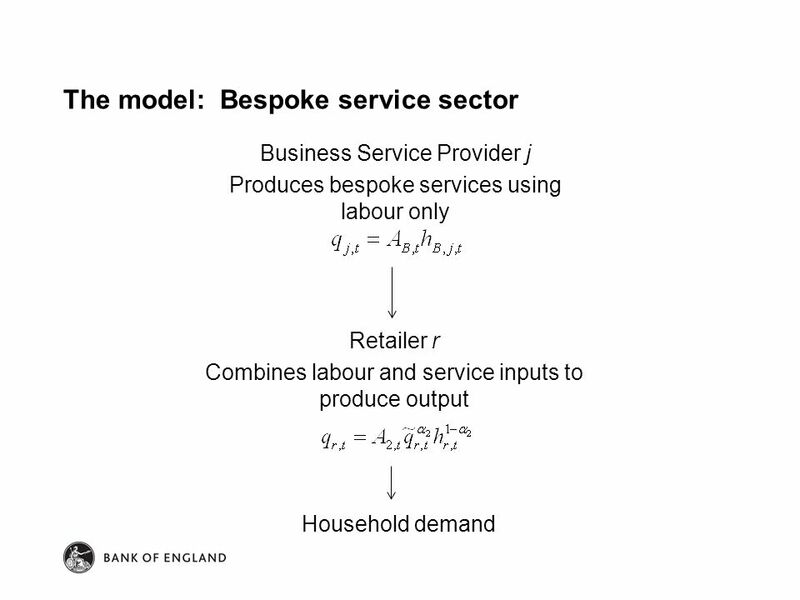 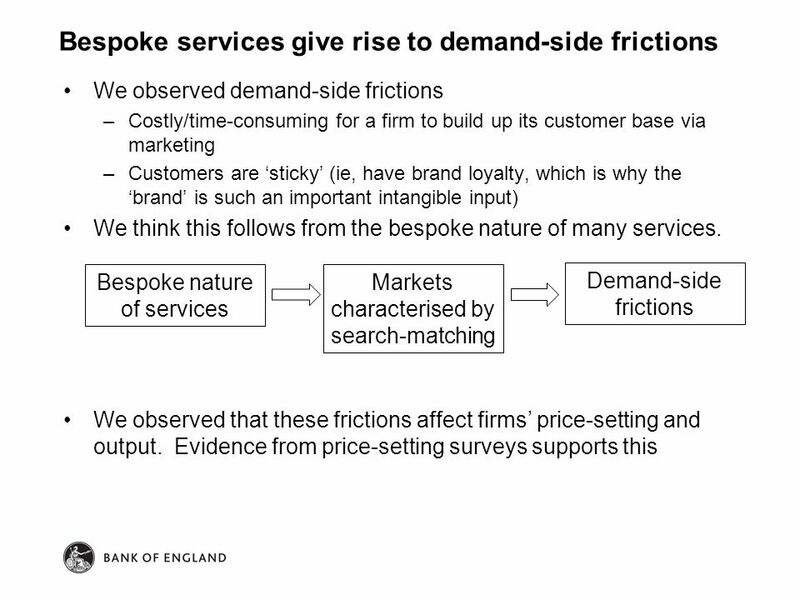 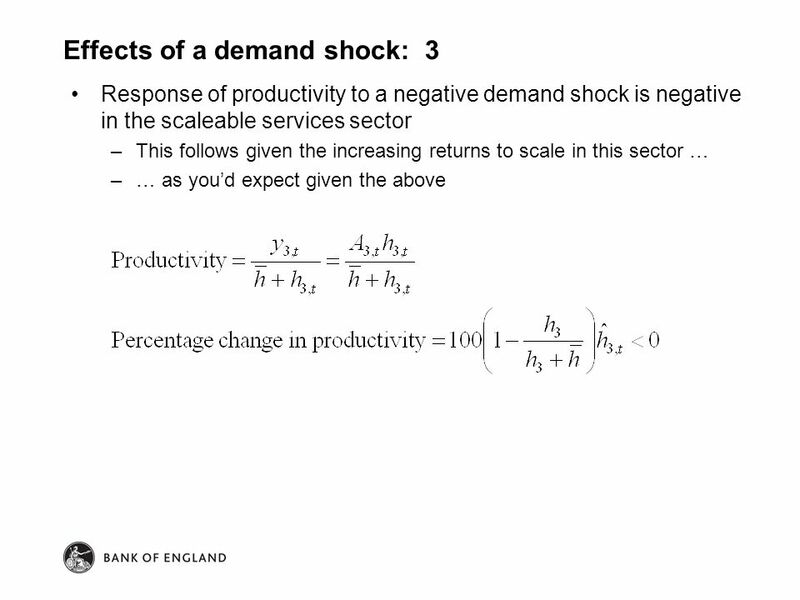 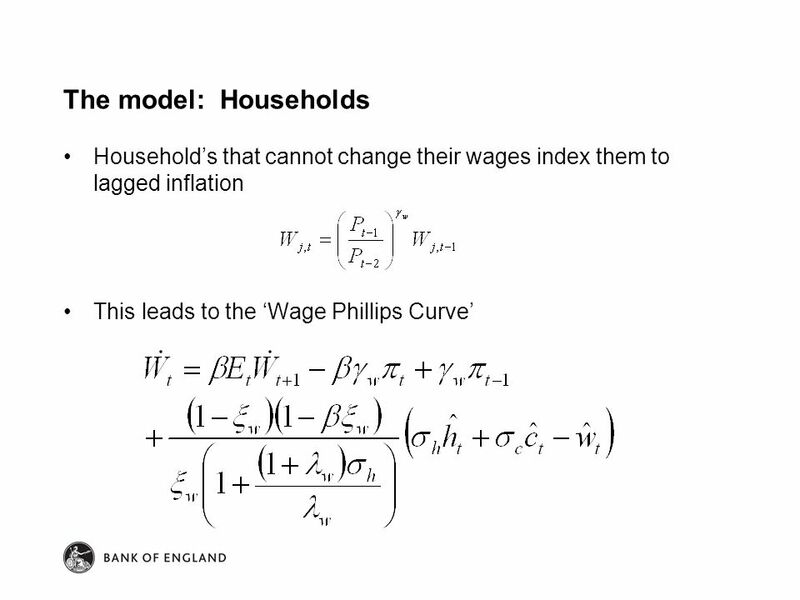 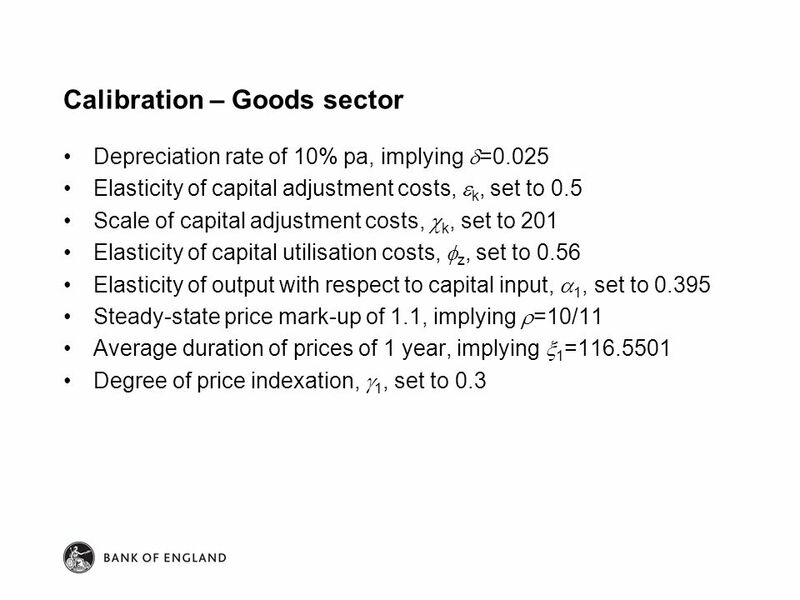 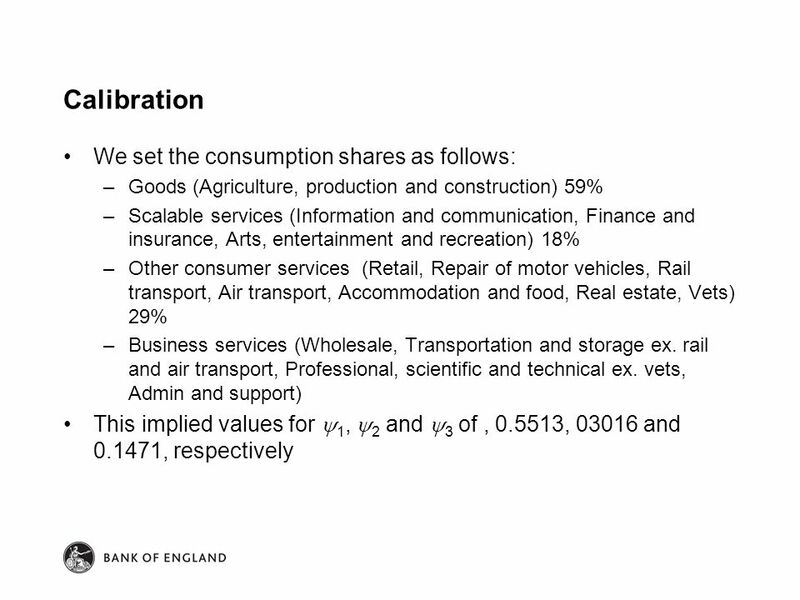 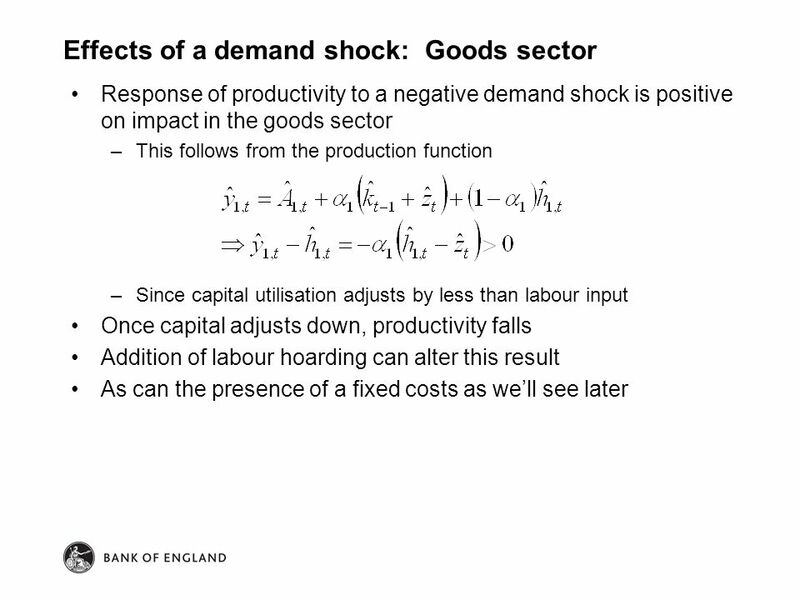 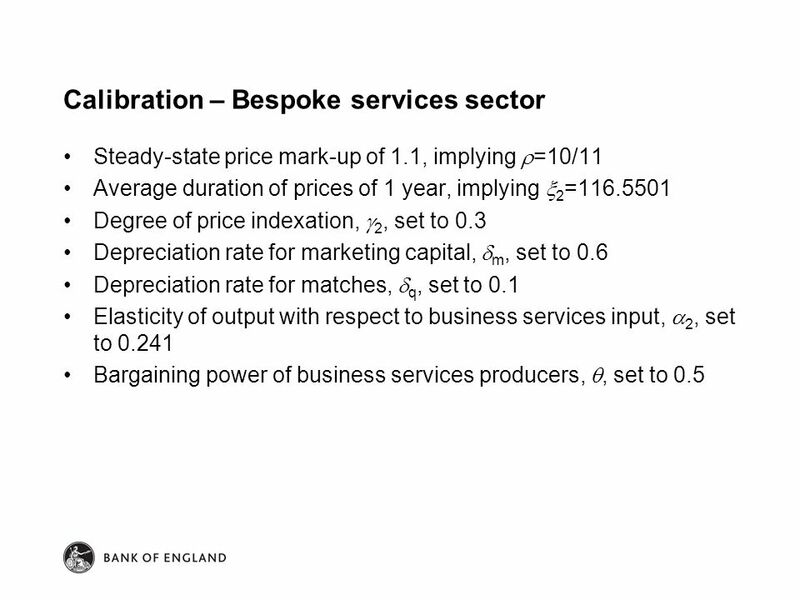 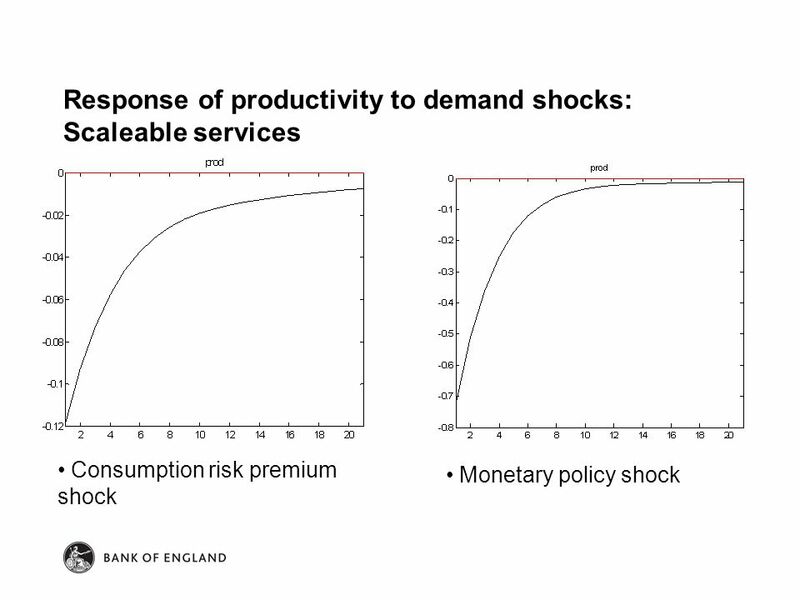 Would better modelling of the service sector improve our understanding of inflation dynamics in the economy as a whole? 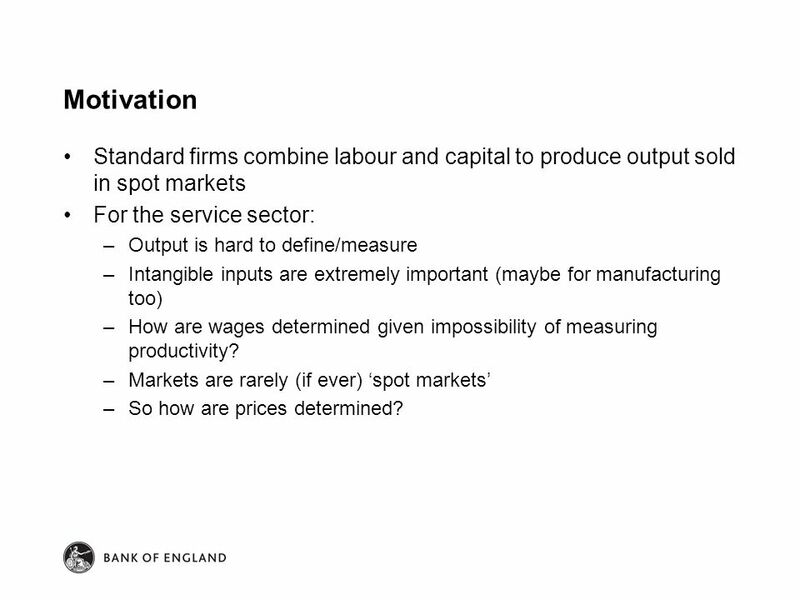 4 Motivation Standard firms combine labour and capital to produce output sold in spot markets For the service sector: –Output is hard to define/measure –Intangible inputs are extremely important (maybe for manufacturing too) –How are wages determined given impossibility of measuring productivity? 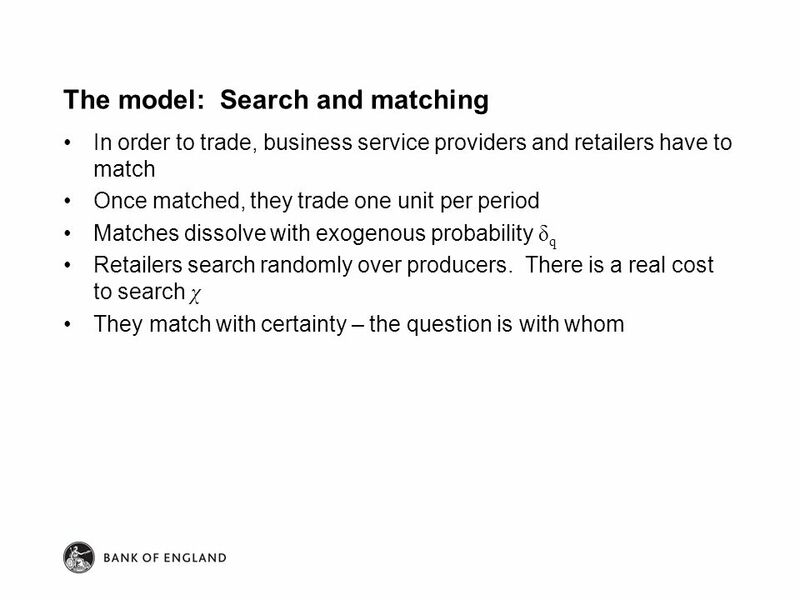 –Markets are rarely (if ever) ‘spot markets’ –So how are prices determined? 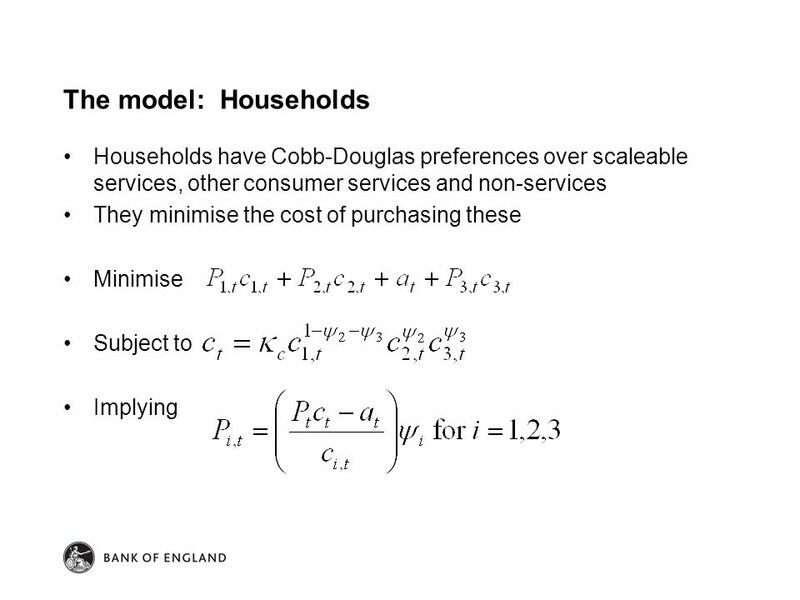 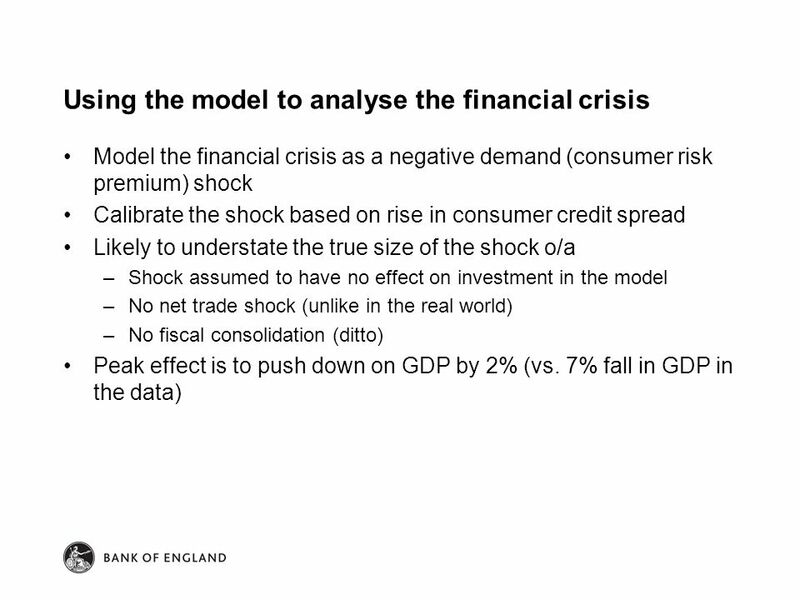 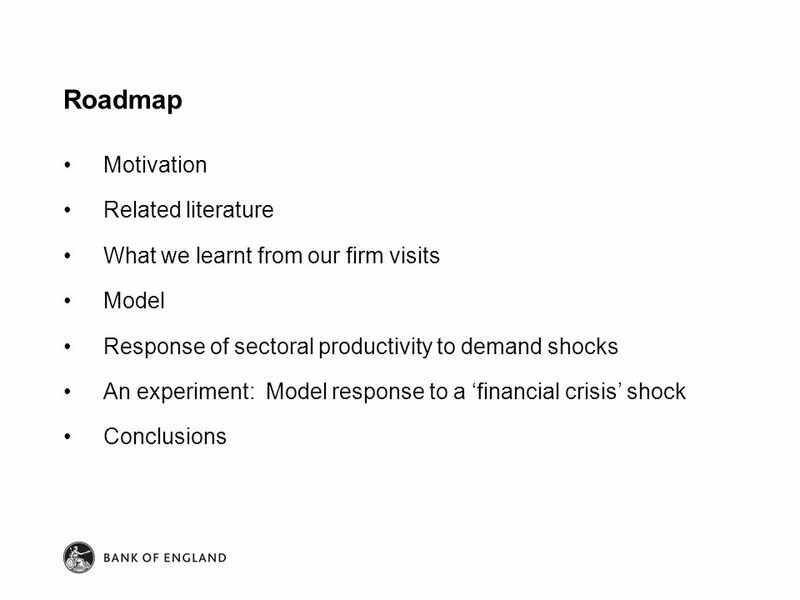 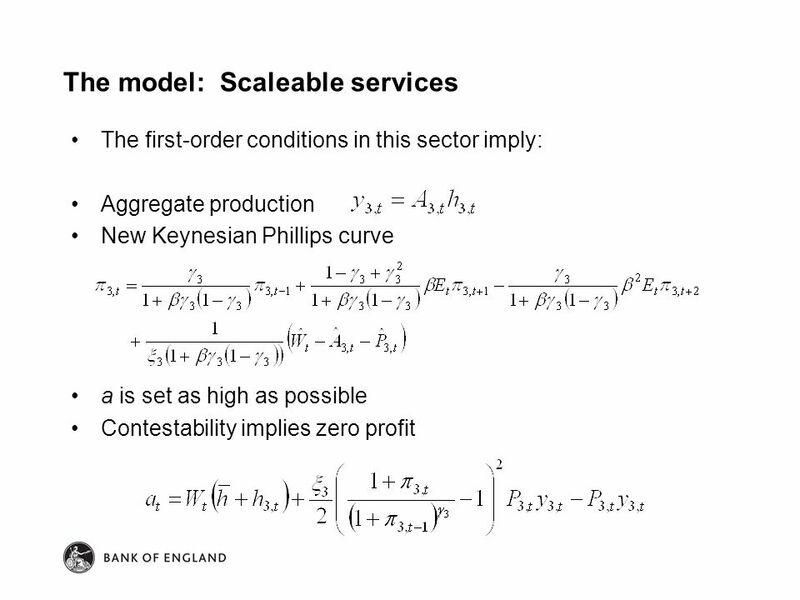 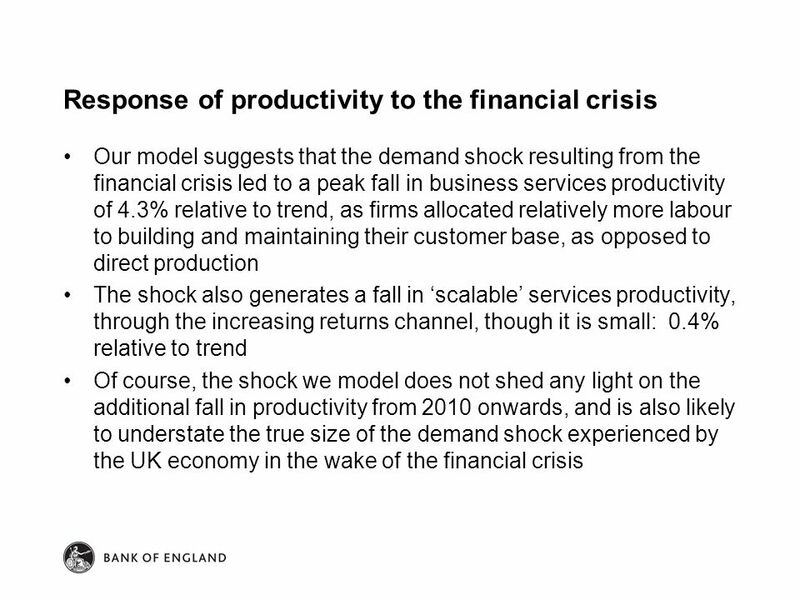 Download ppt "Modelling the Services Sector Stephen Millard Bank of England, Durham University Business School and Centre for Macroeconomics Phil King Bank of England." 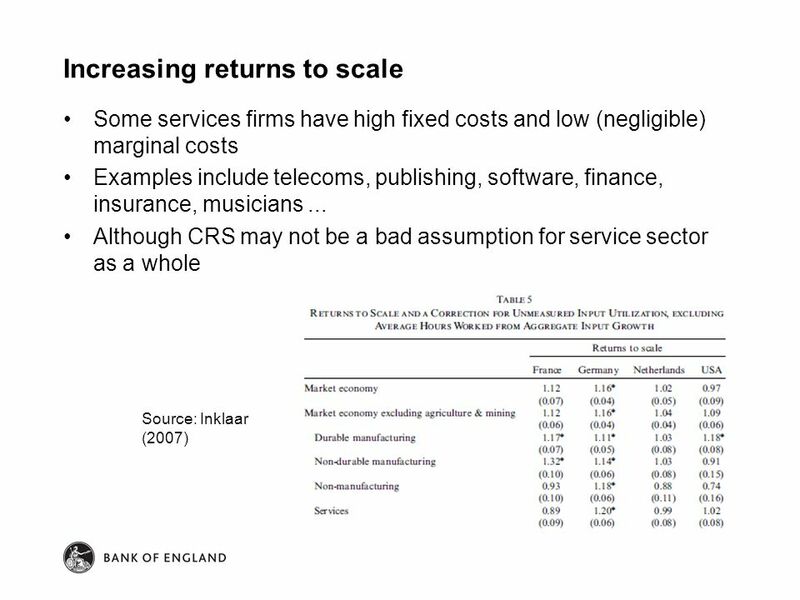 Comments on What are the constraints on inclusive growth in Zambia? 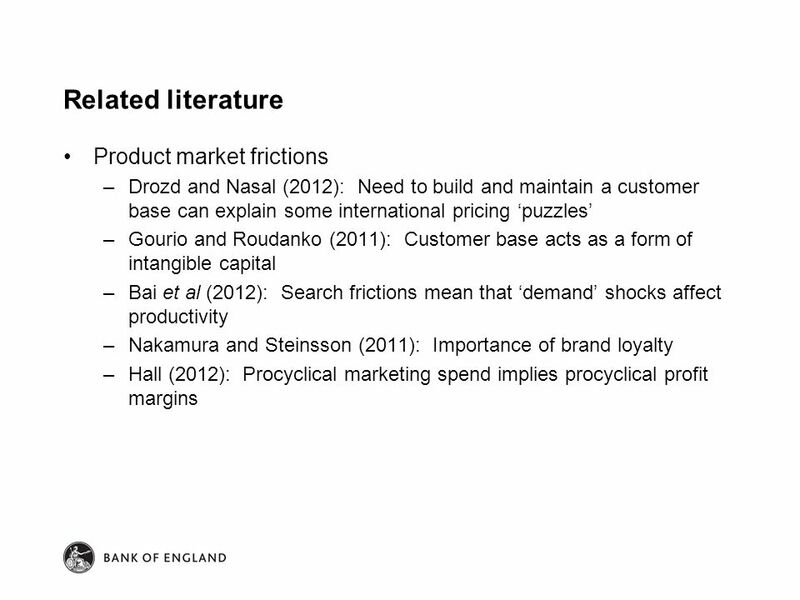 Elena Ianchovichina and Susanna Lundström Arne Bigsten University of Gothenburg. 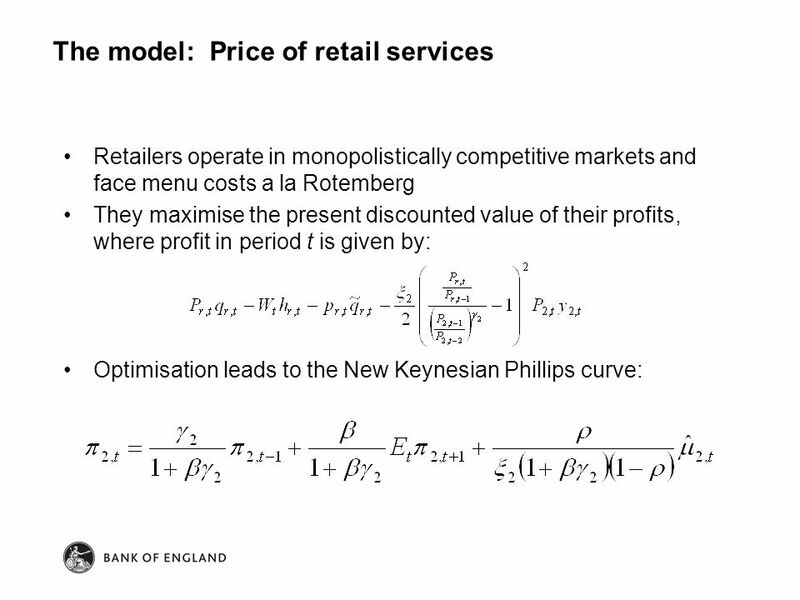 © The McGraw-Hill Companies, The classical model of macroeconomics The CLASSICAL model of macroeconomics is the polar opposite of the extreme Keynesian. 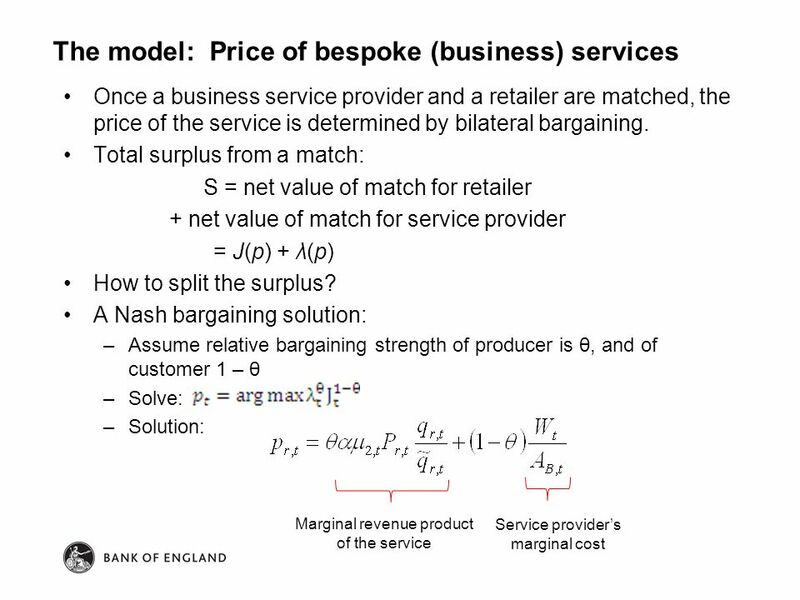 MACROECONOMICS What is the purpose of macroeconomics? 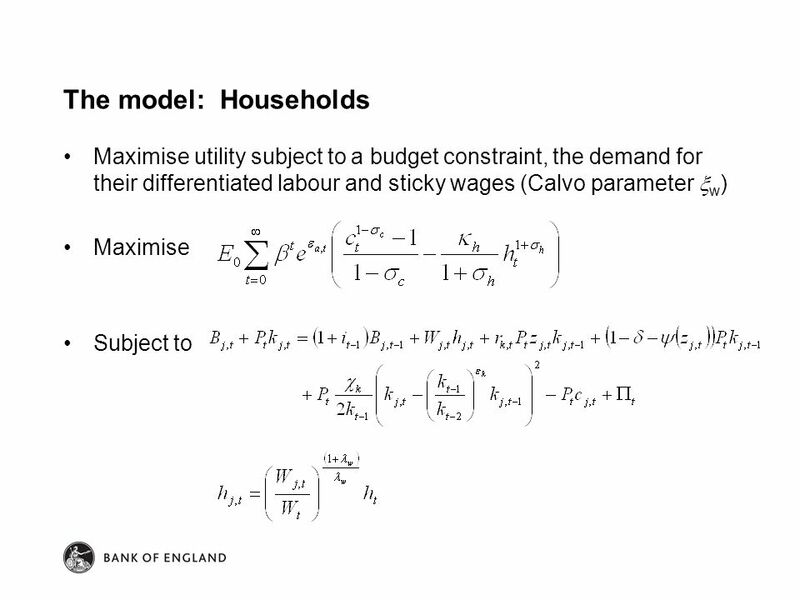 to explain how the economy as a whole works to understand why macro variables behave in the way they. 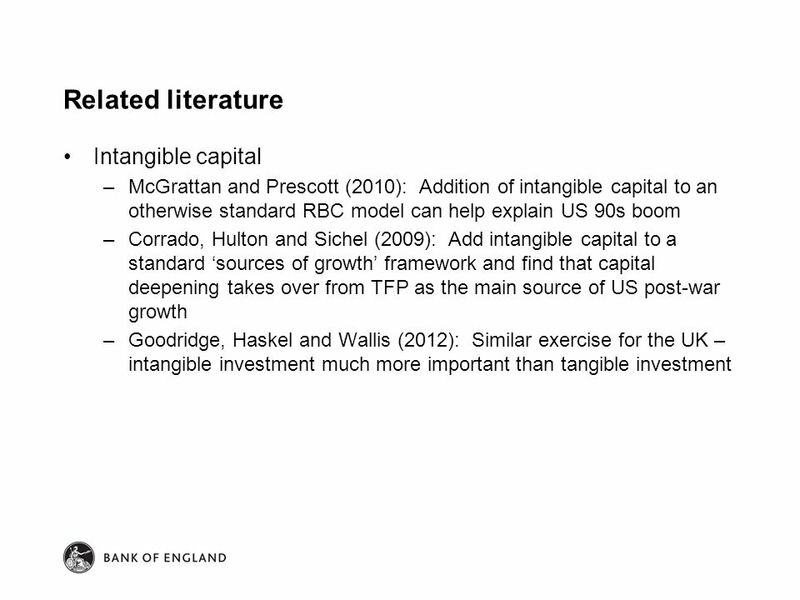 Firm-Specific Capital, Nominal Rigidities and the Business Cycle Dave Altig Lawrence Christiano Martin Eichenbaum Jesper Linde. 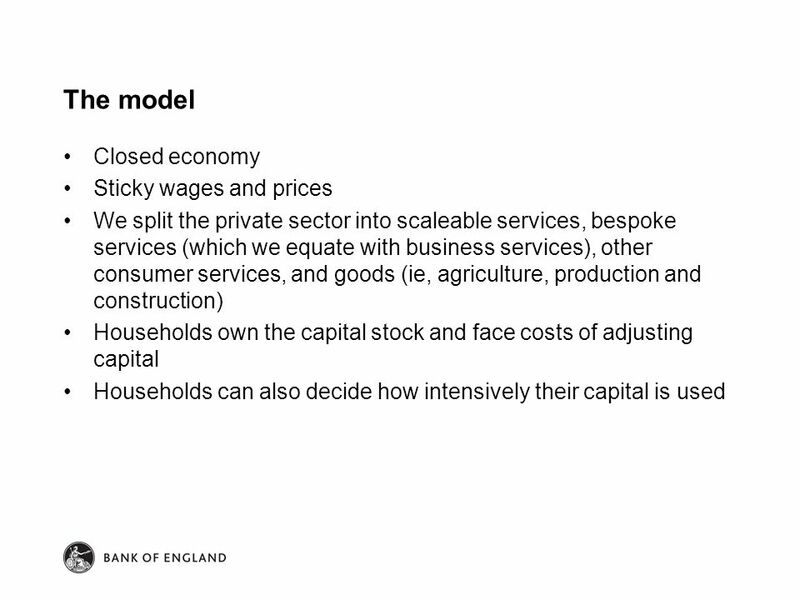 The Bank of Israels Monetary Model Prof. Zvi Eckstein Deputy Governor – Bank of Israel 2008 Outlook of the Local and Global Capital Markets. 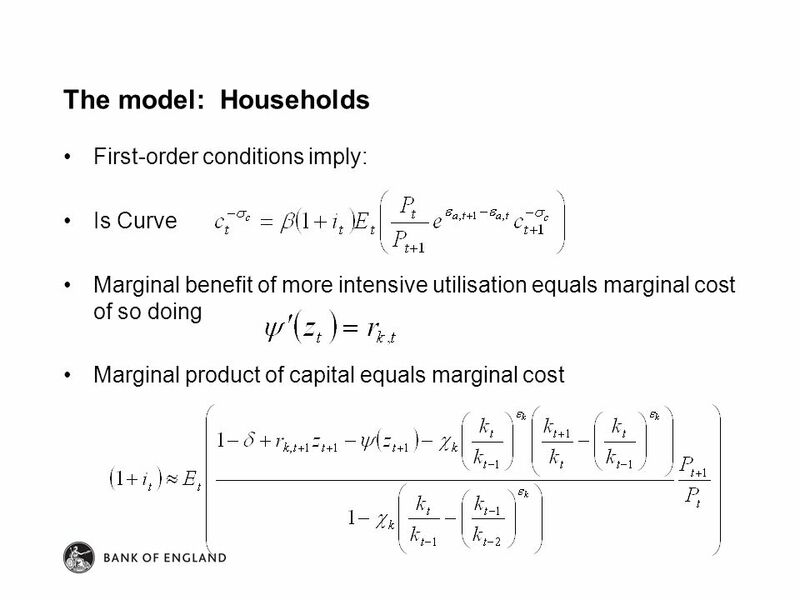 DSGE Modelling at Central Banks: Country Practices and How it is Used in Policy Making Haris Munandar Bank Indonesia SEACEN-CCBS/BOE-BSP Workshop on DSGE. 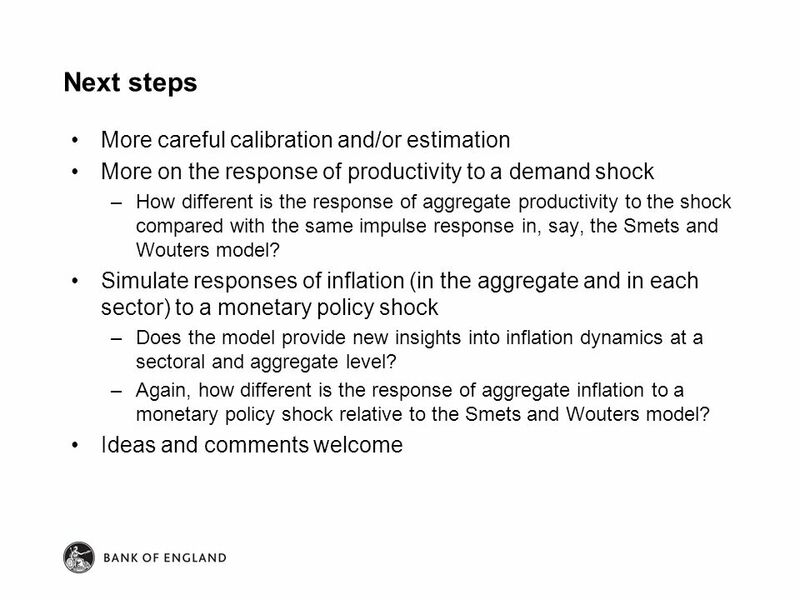 Credit frictions and optimal monetary policy Cúrdia and Woodford Discussion Frank Smets Towards an integrated macro-finance framework for monetary policy. 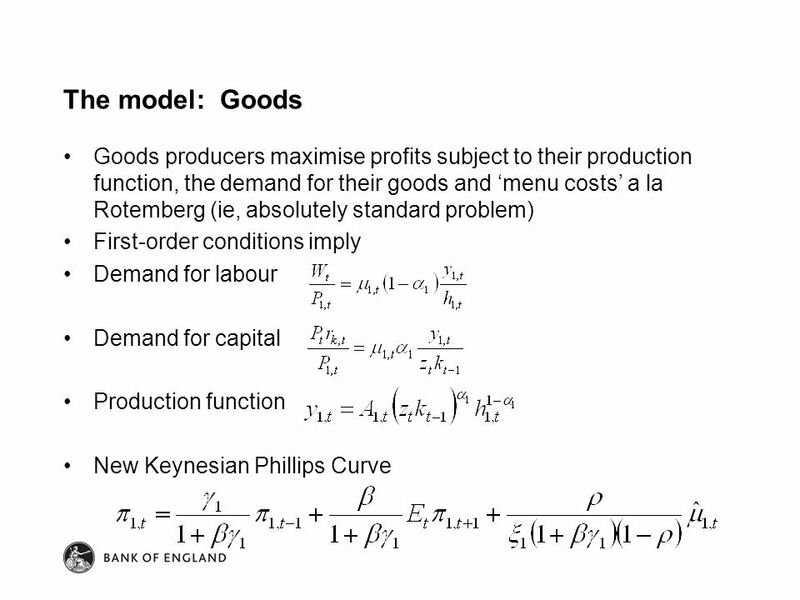 Real Business Cycle Theory Graduate Macroeconomics I ECON 309 – Cunningham. 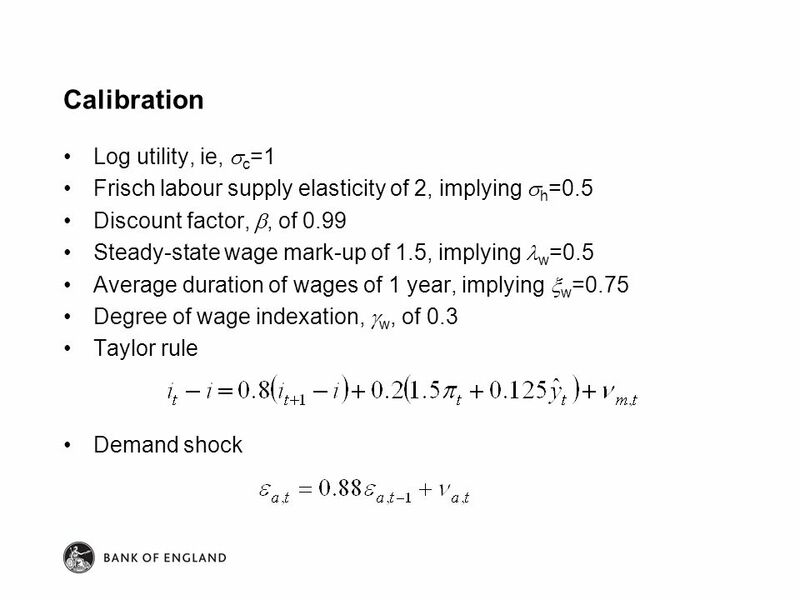 CEE (2005) SW (2003, 2007) “Can models with moderate degrees of nominal rigidities generate inertial inflation and persistent output movements in response. 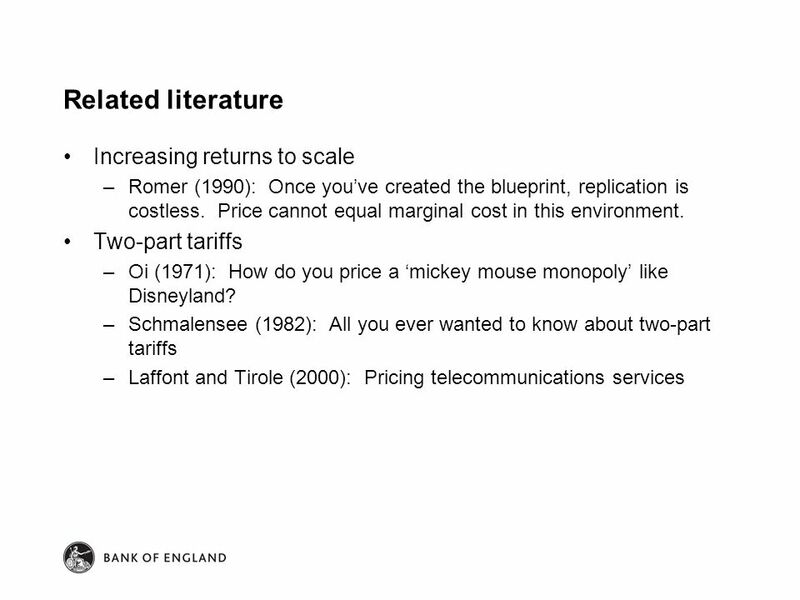 Chapter 11 Classical Business Cycle Analysis: Market-Clearing Macroeconomics Copyright © 2012 Pearson Education Inc.
Chapter 5 A Closed- Economy One-Period Macroeconomic Model Copyright © 2010 Pearson Education Canada. 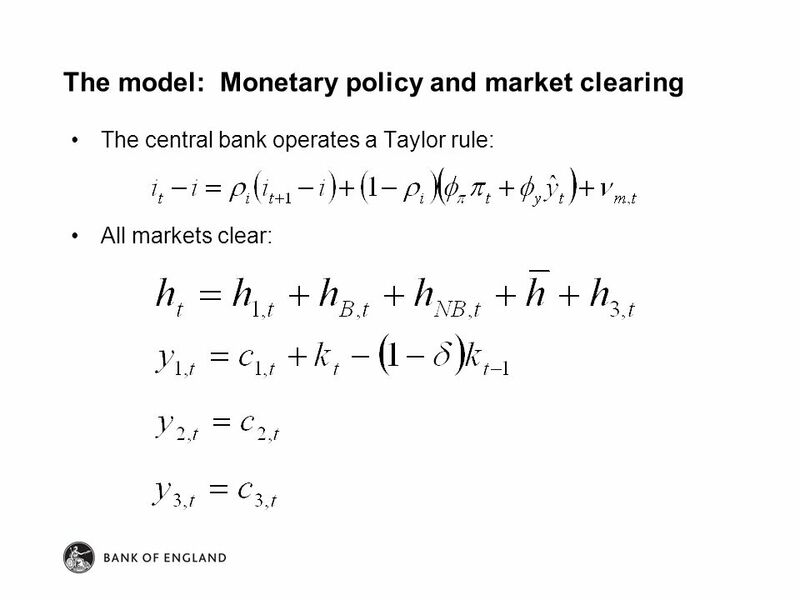 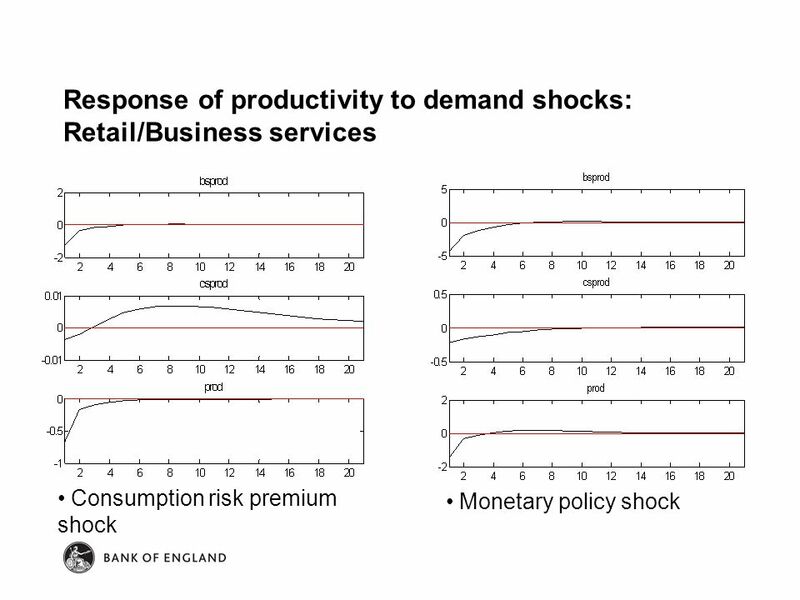 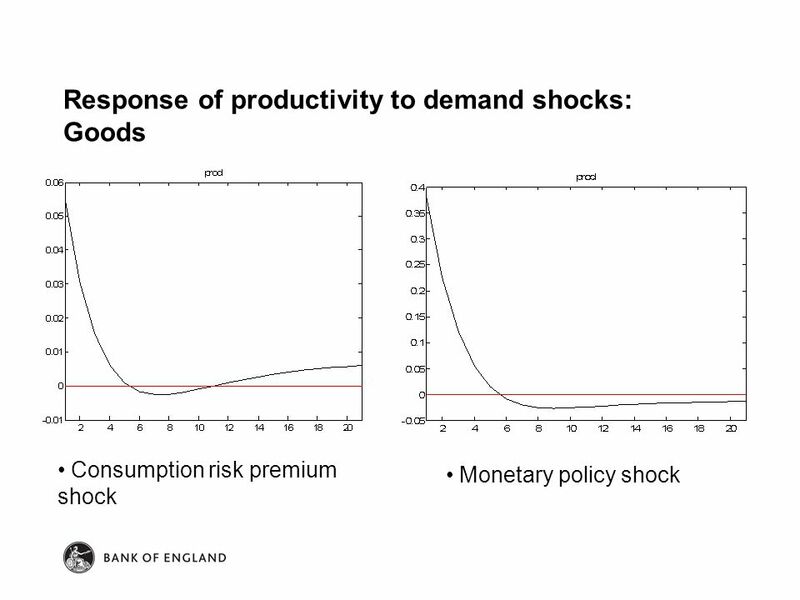 Lecture 7 Monetary policy in New Keynesian models - Introducing nominal rigidities ECON 4325 Monetary policy and business fluctuations Hilde C. Bjørnland.